But if you ask me, summer ends as soon as the thermometer dips into the 40's... Anything below 50 degrees my friends, is. not. summer. - I've started wearing boots... and a coat. I had to go coat shopping for the first time since college. I will say that not everyone thinks this is coat weather. Some people seem to be totally comfortable in a t-shirt, they are obviously not from Texas. Me: Yeah, Chicago is a great city. I just moved up here in June from Houston. Stranger: So you haven't experience a Chicago winter yet? They all have this evil cackle... like they find it funny to watch southern transplants turn into popsicles at the bus stop. "We don't do anything for like four months. Load up on TV seasons and movies you won't want to leave the house." "Boots... lots of boots. Warm boots, boots with fur, snow proof boots, water-proof boots, boots for when the snow melts, and it's not so cold, but it's all slushy and salty...you'll need boots for that too." "You want to be covered from head to toe. Seriously. Nothing showing but your eyes, like a burka... a snow suit burka." A snow suit burka...? Sounds like I will either become a bear and hibernate all winter or I'll be moving back to Texas by the first of the year. Praying for a looooonnng fall, and a mild winter. This would happen when Lee is out of town. Our wine fridge has been making this terrible noise for over a month now. I figured out that if I flip the breaker, wait a few minutes then turn it back on the noise isn't so bad... for awhile... then it starts up again. Well, it was extremely annoying this afternoon, I kicked it a few times... when that didn't work, I flipped the breaker... then I forgot. A couple hours later when I realized the power was still off in the entire kitchen I turned it back on, and there was a puddle under the wine fridge. Oh. Great. I kicked it and now it's leaking.... awesome. I decided I would try to fix it. Then I imagined myself getting electrocuted and Lee finding my charred body when he got home on Sunday afternoon. 10:07 pm - Am I crazy? No... no the puddle is back.... this is bad. 10:10 pm - Stare at open fridge trying to think of something intelligent to do. 10:15 pm - Google - "why is my fridge leaking?" 10:43 pm - Attempt to remove faux column from counter in order to unplug fridge. Use various screw driver bits, hammer and banging with fist to finally remove the damn thing. 10:55 pm - Find out I removed wrong column. I'm even too tired to think of a way to end this post... so, I'll deal with this in the morning. Lee and I had our first Chicago Parks Golf experience last weekend. Lee has only been golfing out in the 'burbs since we got here, so he was skeptical. Rule #1: No selling drugs?? Huh. I thought selling drugs was actually against the law and not just "Respect"... weird. Upon entering the golf course we came across a wedding complete with elaborate dresses, large church hats and The Jackson Five playing mid-ceremony. On the course we were privy to a music festival where we heard things like... "Praaaaaise Jeeeeesuuuuus!" and "Goooood bless the south side! Goooood bless the west side!" Then... on hole 5, I hurt my back because apparently I'm 27 going on 70 and couldn't finish the round. I seriously hope my back gets better because I cannot wait to go back. Yesterday was the worst day. To make things worse I just bought $50.00 worth of Kindle books! I haven't bought a Kindle book since last July... a whole year... and the minute I do my Kindle dies. Maybe I'm being punished for buying 50 Shades of Grey? While mourning the loss of my Kindle I decided it was time to invest in a library card, especially since there is a 750,000 square foot library two blocks from my house. I made my way down to the library feeling a little bit better about my Kindle. Me: Hi. I'd like to get a library card. Library Dude: Picture ID with proof of Chicago address. LD: We don't accept that. LD: No. We don't accept apartment leases because someone could go down to Wal-Mart purchase a general lease, copy it, and sign it to falsify residency. Me: That's sounds like a lot of trouble for a library card. Me: Ok... well what do you suggest I do? LD: We will accept a voter registration card, an electric or gas bill with your name and address or a piece of mail postmarked in the last 30 days. Me: Alright, I'll go home and get some mail. LD: Or your voter registration card. Me: Yeah, well like I said I just moved here so I haven't really gotten around to that yet. Me: stares... Thanks for your help. Lee: Hey, you got a check in the mail! Me: Ugh! But that has my business name on it, I need a letter with my name... Oh! Hey!... here's one! Lee: Sooo... why are you more excited about your name than money? Me: So then he was all, "Or your voter registration card..."
Me: Ha. Yeah. But I mean who would go through the trouble to falsify a lease for a library card?! Lee: Keely.... Knowledge. Is. Power. Today, after carrying a box to the library, (because it was the only piece of mail of mine that had my name and a 30 day post mark on it) getting a lecture on the importance of protecting my library card... from different librarian... (who wore white gloves by the way...strange..) I am the proud owner of a Chicago public library card! Officer: How did you obtain my property? Officer: How. Did. You. Obtain. My. Property? At this point, both Mr. Bigg and I were staring at him sideways, like that was supposed to help make sense of this situation. He motioned his head toward Mr. Bigg. Then he burst out laughing…. like a deep belly laugh. He had cracked himself up. Me? My laugh was more of an “I STILL have no idea what you’re talking about…but I’m going to laugh because you’re laughing” laugh. Officer: That is the most beautiful dog!!! He is just beeeeeauuuuutiful! Officer: Great dog! Great dog! He is still laughing, he seems like quite a jolly man. Then he stops, regains the angry expression from before, rolls up his window and reverses down the street. While this is all a little bizarre it’s not really that surprising. Every time I take him outside people oooo and ahhh over him. People stop me and ask questions about him, I don’t know if people here are just super friendly, or if they actually love my dog. Really? She’s never seen a brown Chihuahua? Do they not have Chihuahuas in Chicago? I guess I’m just confused because in Texas Chihuahuas don’t seem to be too popular. In Chicago, Bigg is Beautiful! And I have to say, I don’t blame them for thinking so! 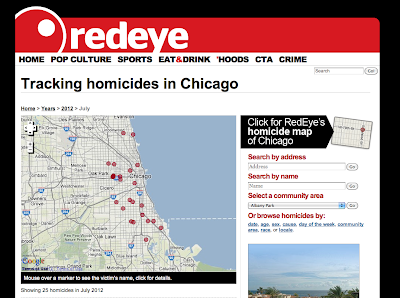 Oh you know, just your everyday interactive map of murder. Through this site you are able to get the latest on all thing homicide. For example, I just learned that there have been 27 stabbing deaths recorded this year. 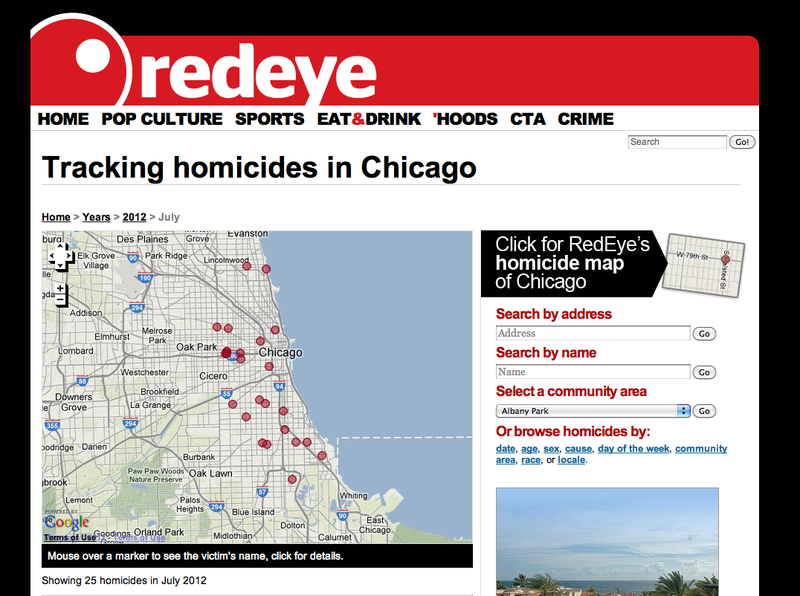 The same number as all stabbing related murders in 2011. And did you know, that by the end of June Chicago had seen 250 homicides, which is up 36% from last year and is the worst start to a year in 9 years? 9 YEARS!!! Not good for my overactive imagination. Not good for paranoia. I’m never going to sleep…. After a year of hiatus I have decided to jump back on the blogging bandwagon. We have officially been back from the Philippines for a year, and about a month ago we moved from Houston to Chicago. While I don't anticipate as many "mis-adventures" in the Windy City I'm looking forward to all the fun it has to offer. Stay tuned!